← Destiny met – Pierre and me. What should a button do? The last several things I have sewn have been button-free, using zippers or hooks to accomplish that all-important task of “closure”. I’ve discovered I can go button-free just so long, and then I have to indulge my passion for those small wonders, with their miraculous power to be both eye-catching and practical. I will leave a serious discussion of vintage buttons to the experts, but looking anew at some of my still-carded vintage buttons has revealed some interesting tidbits, too good not to share. For example, it seems a lot of attention was given to “presentation” of the buttons on their cards. These Luckyday buttons not only have a sweet lady on the front of the card, there is also a “Handy Rule for Mending” on the back. I am guessing these buttons are from the late 1930s or early ’40s. It also seems that patriotic themes were commonplace. There is no company named on these buttons, just the American eagle on a shield with the words TRADE MARK. These simple buttons are quite eye-catching on this deep red card. This is one of my favorite button cards of all time, the Maid in America. I doubt I’ll ever use these buttons, as it would seem a shame to take them off this amazing card. This button card is like a small piece of folk art! La Mode buttons are still manufactured – and still “Superior Quality”, and Costumaker buttons were “made in the U. S. A.”. An ad from February/March 1958 features a fashion picture which looks incredibly timely today! The featured fashion colors are certainly right for 2012! And by 1960, their ads were beginning to take on a more modern look. This ad appeared in the October/November 1960 issue of Vogue Pattern Book magazine. This ad from April/May 1963 asks the question: “What should a button do?” Read the ad to get the answer! One thing I know a button CAN do is be small but powerful! The real truth of the matter mentioned in my first paragraph is that I have a set of buttons which I must use, as they have occupied my mind for the past weeks since I received them – it’s really quite that simple. But they are not simple – they are actually quite demonstrative, and therein lies the rub, to paraphrase from Shakespeare. The buttons which won’t let me sleep! Notice the American eagle motif on the card! I have been pondering how to use them and with what color and type of fabric to pair them. They deserve the perfect venue for more reasons than one. They were gifted to me by my dear friend, Nancy C., who, when we met for coffee a couple of months ago, met me with her family button box in tow. She invited me to pick out any buttons which I thought I could use for future sewing projects! When I got past my incredulity at her offer, I picked out a few amazing single buttons (which you will see eventually) and about three beautiful sets of loose buttons. 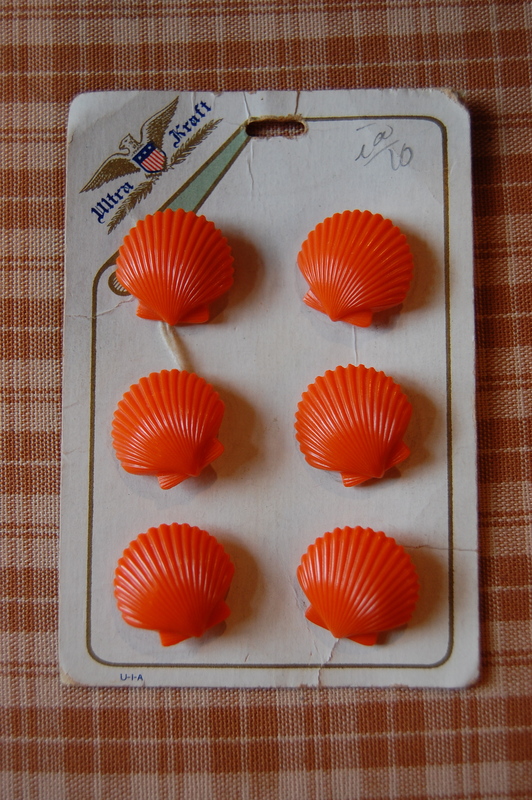 These orange shells, however, sewn neatly to their original card, kept catching my eye (how could they not??) At first, they struck me as just too orange. I wasn’t sure I would ever be able to use them. Nancy and I kept talking about them over our coffee, pondering their color and shape, and then, before I knew it – I was hooked. So you know by now that they came home with me. And something with so much personality moves up in priority on the sewing list! You’ll soon see them sewn onto a “Fifty Dresses” creation. Thank you, Nancy, for this amazing gift, which is only eclipsed by your generosity and friendship!! A little closer look at these bright beauties! Stay tuned to see them doing what good buttons should do… Gulp! I’m hoping to do them justice! Buttonholes mortify me. Something always goes wrong with at least one on a garment. I’ve made one buttonhole during the last 10 months! I need to conquer this fear and will stay tuned to your use of buttons!! I find the hardest part of doing buttonholes is lining them up properly – especially on slippery fabric. It often seems one is a little cockeyed. As many buttonholes as I have made in my life, I still practice before I attempt them on whatever I am sewing! Oh, I can’t wait to see what you do with them!! Love the color! It’s been very interesting planning a whole sewing project around buttons, especially ones that are SO orange! 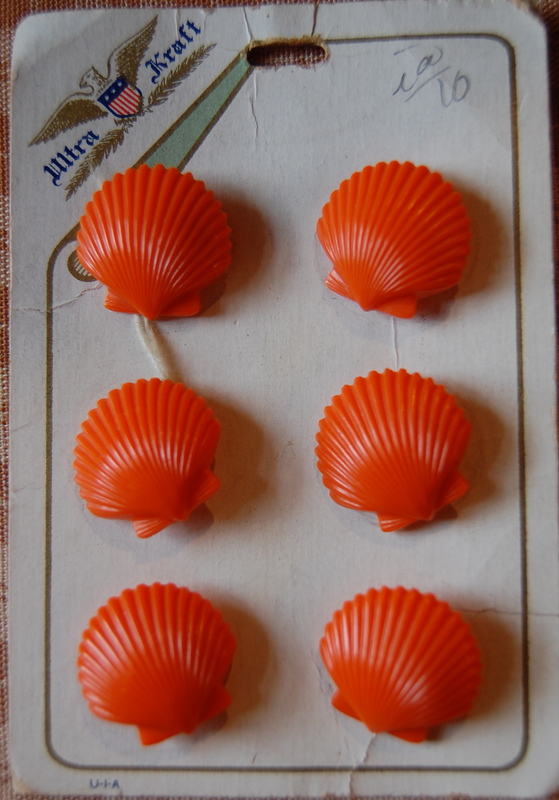 So glad these shell buttons got your creative juices flowing! Can’t wait to see your one-of-a-kind original! love,Nancy C.